VetUK Flea and Tick Treatment for Cats is for the treatment of flea and tick infestations in cats. Each 0.5ml pipette contains 50mg of fipronil and is effective against fleas for up to 5 weeks and ticks for up to 2 weeks. VetUK Flea and Tick Treatment uses the same active ingredient as both Effipro and Frontline, and is just as effective. Suitable for use on kittens that are over 2 months old and weigh over 1kg. Apply 1 pipette of 0.5ml to the base of your cat's neck ensuring it is directly in contact with the skin and is in an area your cat can't lick off. Please follow the instructions on the packet for correct application. Good product, highly recommended, l will use again in the future. EXCELLENTE EFFICACITE mes chats vivent beaucoup dehors et jamais plus ils n'ont de problèmes de puces et tiques ; facile à administrer sur un chat. Good product. Does exactly as you would expect, and is much cheaper than the equivalent branded version (Frontline). I've only given it four stars, as the use by date is 10 months away, so be wary if you're buying in bulk. Highly recommended. Much cheaper than the vets and very effective. Keeping fleas at bay. I had a huge flea problem this summer. I have a older cat and a kitten I tried everything advocate, stronghold etc to no avail. This has been the only thing that actually worked been using it for 8 weeks and flea free I am over the moon great value product that actually works. The flea treatment is great, have no problems with it, however, the tick treatment only works for 2 weeks - as I live surrounded by farmers fields I need longer tick protection for my cats. Hence the 3 stars not 5. Great product though if you live in a city. 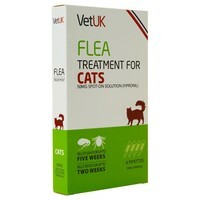 I normally use frontline for my three cats so decided to give Vetuk flea treatment a trial. I thought it was good but my cats got a skin irritation on the site that treatment was applied to. After being given Advocate Flea treatment from the vet which did not work, despite being told it was the best thing on the market, we decided we would try this. Wow ... !!!!! No side effects, incredibly easy to use (no fiddling about breaking contacts to get to the treatment itself (and that noise usually gives a cat enough warning to attempt a massive escape with all legs flailing anyway ... !!) ... incredible price and, best of all, it worked ... !! No more Advocate for this household ... I can't recommend highly enough. Happy cats, happy owner - what more can you ask for ... ?! Been using this for a couple of years on my cat. It's kept her flea free. Tricky to get the last bit out of the pipette while keeping her still. A shorter pipette might work better. I normally buy advantage but this was cheaper at the time, kept my cat flea free. Would recommend. This VetUK own-brand products contains the same active ingredient (fipronil) as the Frontline and other Spot On products. It is just as effective but cheaper. I hope VetUK has offers on this more frequently! Effective treatment, easy application at a good price. This seems to work just as well as Frontline, but like Fleavox, the design of the pipettes is not quite so good, and it is more difficult to extract all of the liquid. I have 13 cats in the family and use this product as well as others. Never had a problem with this and works just as well as he leading brand but more affordable. 5star product. This flea treatment is as good as all other fipronil products and it works on ticks too! Makes regular flea treatments more affordable, especially with multiple cats. Used every month, we find this effective and sensibly priced. We have two cats and one of them is a proper hunter so keeping on top of flea and worm treatments is essential. Pleased that there is now a reminder service so I don't forget to reorder! Very easy to use and apply. Great value for money. Great product works perfectly its really well priced and does the job better then anything else I tried would definitely recommend. We at Lyn's Small Animals use this product on all our foster cats that come through, and we have found it is the best on the market. Fleas are cleared up quickly and it is a brilliant preventative. I used this for the first time last year, after hearing lots of reports of Frontline-d dogs and cats still getting fleas! This is so much cheaper, but I found it works just as well. Happy to say I've never seen a flea on them. This product is great! I have 6 cats so I used the multi buy option and got 2 months worth. The cats seem a lot happier and way less scratchy! We seemed to have a mega outbreak and it's put a stop to it straight away! Also kills mites..I discovered them on 1 of my girls but they've all dropped off her and died within 12 hours and she's so much happier! Will definitely reorder! This is amazing, it worked first time and at a fabulous price! I've tried other varieties but nothing is a patch on this one. I now have a happy cat again, thank you. I had been buying flea treatment from my vet until I realised that I could buy a comparable product cheaper online and one that also prevents ticks which this does! Happy owner of flea-free cats! Excellent product for excellent price. Use this regularly on my cat and have had no fleas since. HAving used other fipronil products in the past I am convinced of the effectivity of the active ingredient but now I can buy Vet UK flea treatment at a much cheaper price. So continued flea free happy cats, at a reduced fee! Will be buying again. Paid a small fortune for the other well known brands that just weren't working, this one worked first time. OMG !! I used this a week or so ago and am really pleased with it. It is equally as good as Frontline which I have always used in the past but this is my new friend lol. In all seriousness tho, four flea free cats=one happy mum. The previous treatements jusy stopped working, we used this along with Indorex is a veterinary flea spray and with 2 days noticed a vast difference. Happy cats, will be ordering more. Great product, great price! Worked like a charm. I have new favourite brand for flea treatments! Cecil the cat is very pleased and so is my wallet! used to use another brand but saw this was cheaper and thought id give it a go fleas are gone im happy!